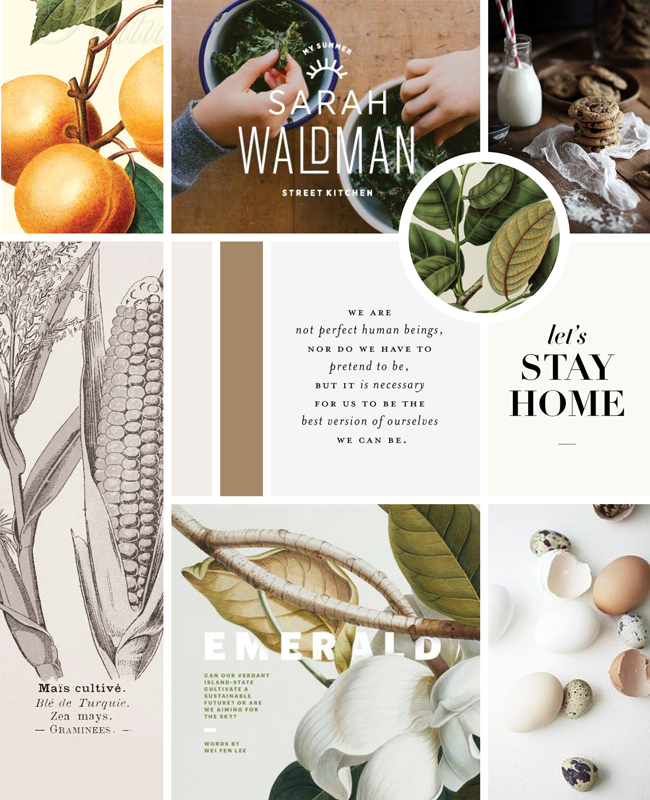 Vintage Modern Cookbook Moodboard — Spruce Rd. Happy Monday! The weather was SO beautiful, I went to the park both Saturday and Sunday, and spent a day away from my computer screen. It felt so nice to have a break :). I wanted to share a sneak peek at a personal project I have been working on for a quite a while. I am designing my family cookbook! Above is the moodboard I created to help me hone in on a specific stylistic direction. I am incorporating a lot of vintage botanical illustrations, mostly in the form of the duotone image of the corn on the lower left. Right now they are used as background images, to add a little interest to the otherwise typographic heavy layout. I have also been busy photographing a few of the recipes to feature as well! It has been so fun to try out several recipes from my Gammy, aunts and cousins. I love creating something so personal, that I know I will treasure forever. I am excited once the book is finished, and will share any progress along the way. Hope you had a great weekend! Here is to a productive Monday!